Honda Racing's British Superbike team is ready to make its comeback this Easter weekend (4-6 April) as the first round of the 2015 MCE British Superbike Championship kicks off at Donington Park. 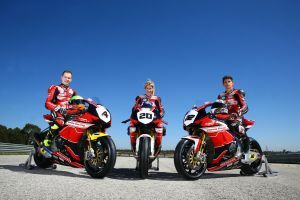 The Louth-based operation returns to the series in dramatic fashion after a year's break from full-time competition, with a three-strong rider line-up of Dan Linfoot, Jenny Tinmouth and Jason O'Halloran who will all be aboard the Honda CBR1000RR Fireblade. Over the winter, the mechanics have been working hard on the bikes and the squad completed a series of successful overseas tests, where each rider completed simulated race runs, worked with different set-ups and recorded encouraging lap times. All three riders also took part in the official BSB test last Thursday at Donington Park and are looking forward to getting out on track competitively for the first round. We're excited to be making our return to the British Superbike Championship this weekend. The whole team has worked so hard over the winter and it will be great to see the result of everyone's effort. We have a really strong, young three-rider line-up this year and a female athlete, with Jenny, who we plan to develop and bring on and we're looking forward to seeing what each rider can do throughout the season. The support for the team already has been great from the fans and we can't wait for the season ahead. I'm really looking forward to the weekend; it's been a long winter and I just can't wait to get the race underway. The tests we have completed have been great and we've collected some positive data. I'm feeling good with the bike, with the team and motivated with myself and just can't wait to get out there. The weekend can't come soon enough, I'm excited to get stuck in and have my first race working with the team. I really love the bike and the team, and I'm looking forward to working with them and learning as much as I can as quickly as possible over the course of the weekend from their years of experience. It's such an experience for me being part of Honda Racing and I love Donington. I'm understandably a little nervous as always at the first round but it's in a good way and I'm super keen to get cracking, I can't wait! I can't wait to get the first race under our belt, it's been a long winter and I've spent time in Australia and the UK preparing and training for it. We've had two really good Spanish tests and a really good outing at Donington last week. Everyone's ready to get racing now, see what we can do and get to work. I've got a great package this year with the Fireblade and a great crew who I work well with, and just want to get there and get racing.